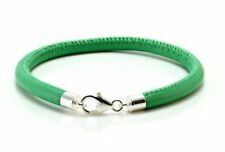 Mens Yellow Gold Finish Sterling Silver Royal Lab Simulated Green Bracelet 9"
The bracelet has26 Genuine Peridot beads each -8mm in size. A simple design with High Quality Green Peridot beads. It's beaded on Hunter Green stretch cord. C hina is a country that loves jade. In Chinese’s deep heart, jade is a symbol of prettiness and nobility. A piece of fine jade can be hard enough with bright and shinning colors. Jadeite is a kind of hard jade. Material: Ceramic & Rope. Why need Stainless Steel Jewelry?. High quality stainless steel has high resistance to rust, corrosion and tarnishing, which requires minimal maintenance. 1 x Bracelet. Why choose Stainless Steel Jewelry?. 【High Quality】 Real Scorpion in gorgeous man-made amber. 【Gifts】 It is an ideal gift for people who love insect. 【Details】 All the details of the Real Scorpion inside can be seen. Material: Amber Real Scorpion. 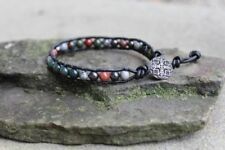 Buy 2 and Save 2nd bracelet discounted!! 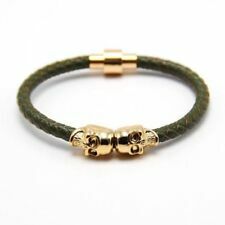 The bracelet has26 Genuine Jade beads each -8mm in size. A simple design with AAA Quality Jade Quartz beads. 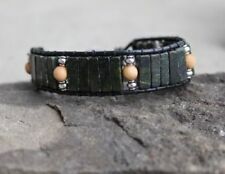 It is beaded on HUNTER GREEN stretch cord. Genuine Green Russian Amazonite Bead Bracelet for Men (On Stretch) 6mm AAA - 8"
The bracelet has34 Russian Amazonite beads each -6mm in size. A simple design with AAA Quality Green Russian Amazonite beads. It is beaded on brown stretch cord. The beads feel very gemmy and lustrous. Makes a great gift for dad, brother, son, grandson, grandfather, husband, boyfriend, teen, best friend or any special man in your life. 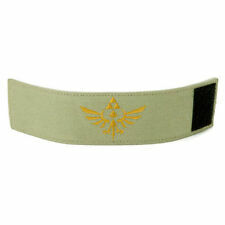 Bracelet is expandable. Excluding Alaska/Hawaii, US Protectorates. Pick one style in each dropdown box & hit Buy it Now! Clasp: Key Clasp. Material: Stainless Steel & Leather. Bead Size: N/A. Color: Green. 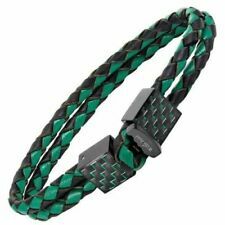 These 1/2" wide unisex bracelets are made of small black and green seeds strung on braided cord with a slip knot closure that is adjustable between 6" and 10" in length. Handmade in Peru. Fair Trade Product. Genuine Yellow and Purple Agate Facetted Bead Bracelet for Men Stretch 8mm - 8"
Natural Green Rutile Quartz Black Tourmaline Bead Bracelet Men Stretch 10mm - 8"